Foodgrain exports forecasts for 2012-13 by the USDA’s WASDE. These are the major exporting countries, exports in million tons. In this late February capsule of the foodgrain forecasts from the International Grains Council (IGC) and the US Department of Agriculture’s WASDE (world agriculture supply and demand estimates) we see estimates for slightly higher production, but also somewhat lower consumption. The question is: what about stocks, on which there is never enough knowledge distributed as to who holds them (government or private, traders or bankers) and how they are used by food markets or agricultural commodities markets? Following minor revisions to the 2012-13 forecasts, the estimate for total grains end-season stocks (excluding rice) has been revised up by 4mt to 326m, including increases for both wheat and maize. Overall, however, they remain down 40mt year-on-year at a six-year low, or a 17-year low for the major exporters. IGC’s 2013 February grain market report presented the first forecast for the 2013-14 supply and demand balance for wheat. “While world output is tentatively projected up 4% year-on-year, much is expected to be absorbed by higher demand and end-season stocks are likely to rise by just 2mt, following a 21m decline in 2012-13. The forecast for 2012-13 end-season maize stocks has been revised 1.7mt higher this month, but major exporters’ end-season inventories are still put at a 16-year low,” said the 2013 February report. According to the IGC – Major exporters’ stocks for 2012-13 are revised down by 1.5mt, to 49.9mt, but upward revisions for China and India raise the global total to 176mt, which is still down 21m from last year. Increases for Brazil, Iran and Russia help to lift the 2012-13 world trade forecast by 0.8mt this month, to 137.4m. World output for 2013-14 is tentatively projected up 4% year-on-year, but much is expected to be absorbed by higher demand leaving little room for stock building. According to WASDE – Global wheat supplies for 2012-13 are nearly unchanged with a small increase in beginning stocks more than offsetting a small decrease in production. Global wheat output is projected 0.7 million tons lower. Production is lowered for Kazakhstan and Brazil, but raised for Ukraine, South Africa, and Belarus. Global wheat consumption is virtually unchanged at 673.4 million tons; however, global consumption is projected down 24.6 million tons year to year, mostly reflecting lower feed and residual use in 2012-13. World wheat ending stocks for 2012-13 are also nearly unchanged this month at 176.7 million tons. According to the IGC – At 466mt, world rice production is forecast to be little changed year-on-year, as smaller harvests in Asia, particularly in India, are offset by gains elsewhere. World use is expected to rise by 2% year-on-year, to a fresh record, underpinned by increases in Asia’s leading consumers. Global ending stocks are forecast to fall marginally, but supplies in the major exporters are expected to rise to a new record. World trade in 2013 is projected to decline by 5% as key importers in Asia and Africa reduce purchases from last year’s highs. According to WASDE – Global 2012-13 projections of rice production and consumption are raised from last month, but trade and ending stocks are lowered. Global 2012-13 rice production is forecast at a record 465.8 million due to increases for Bangladesh, Bolivia, and Nepal partially offset by reductions for Argentina and Laos. Global consumption is raised 0.7 million tons to a record 469.3 million as relatively small changes are made to several countries including Bolivia, Iraq, and Nepal. Global exports for 2012-13 are lowered slightly due mainly to reductions for Argentina and China. Imports are reduced for Bangladesh, Cuba, Egypt, and Indonesia. Global 2012-13 ending stocks are reduced 0.5 million tons to about102.0 million due mostly to decreases for Egypt and Indonesia. According to WASDE – Global coarse grain supplies for 2012-13 are projected 2.1 million tons higher as a decrease in beginning stocks is more than offset by a 2.9-million-ton increase in production. Lower 2012-13 beginning stocks mostly reflect an increase in 2011-12 corn exports for Brazil and revisions to the Paraguay corn series that lower 2011-12 corn area and yield. 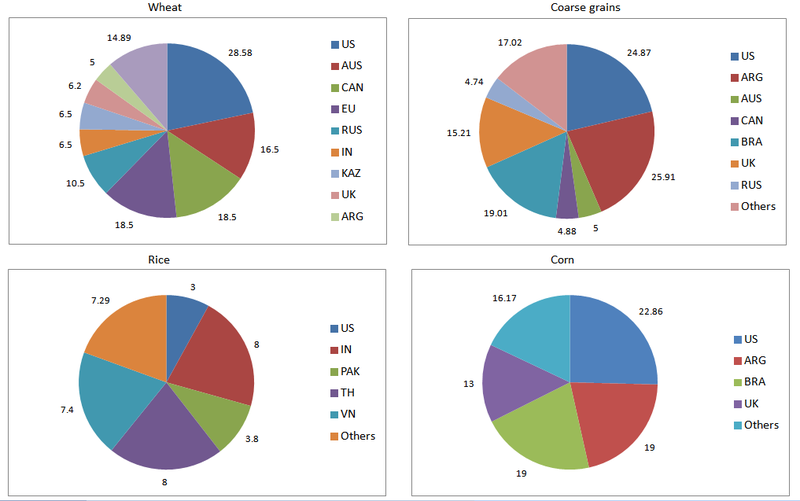 Global 2012-13 production is also higher this month for sorghum, barley, oats, and rye. Sorghum production is raised 0.4 million tons for Mexico with higher area and yields for the summer crop, but lowered 0.2 million tons for Australia with reduced prospects for area and yields. Global barley, oats, and rye production are up a combined 0.6 million tons on larger reported crops for the FSU-12 countries. According to the IGC – Global production is forecast to decline by 3% year-on-year, with sharp falls in the US and EU offsetting rises elsewhere, including in China and the southern hemisphere. Despite some less than ideal weather in recent months, Brazil and Argentina are still set to harvest record crops. Due to tighter supplies, world use is expected to dip by 1% year-on-year, led by reduced demand from the US ethanol sector. With total use again expected to exceed production, closing stocks will decline for a fourth consecutive year, including a sharp drop in the major exporters. Market commentary – After showing some strength in early November, global grain export prices were again in retreat, though with rice once more the exception. Overall, IGC’s GOI index fell by 16 points, or 6%, to a 13-month low. The recent market downturn can be partly ascribed to bearishly perceived market fundamentals, as harvests neared completion in the northern hemisphere and work started south of the equator. But it was also in reaction to deepening financial uncertainties, notably in Europe, affecting nearly all commodities. Heavy supplies of wheat amid strong export competition, including from new crop grain out of Argentina and Australia, mostly reduced fob values by between $20 and $30 over the past month, narrowing the gap with Black Sea quotations. Despite initial support from US cash markets and a smaller official crop estimate, CME maize futures in Chicago saw major speculative selling, partly due to increased competition from other exporters but with sentiment considerably dented by worries about the global financial crisis and the collapse of a major brokerage firm. Similar pressures were evident in oilseed markets, led by a decline in US soyabeans, values of which dipped to their lowest since October 2010. As measured by IGC’s sub-index for rice, export prices of this cereal remained firm in the past month: within this measure, quotations in Thailand saw further gains, attributed to the country’s severe floods, while those in Vietnam and South Asia weakened. Grains – Reduced grain crop estimates for some major producers, including for maize in the US, are only partly offset by increases in the CIS and elsewhere, trimming the global production total for 2011-12 by 3m. tons from October, to 1,816m. This would still represent an increase of 64m. tons over last year, largely due to sizeable recoveries in output in Russia, Ukraine and Kazakhstan. Production of all crops except sorghum will rise this year, with the biggest increases in wheat and maize. Southern hemisphere prospects remain favourable, with rains in South America and Australia mostly boosting yield expectations for wheat and helpful for plantings of maize and sorghum. Consumption of grains will also increase in 2011-12, especially in the feed sector, including a marked rebound in Russia after the previous year’s drought. At 1,826m. tons, world use is expected to show a rise of 2.2% from the previous year. However, a feature this year will be the marked slowdown in the expansion of industrial use, set to rise by only 1.7%, to 303m. tons. Within this figure, the use of grains in fuel ethanol, which has displayed huge growth in the past decade, is expected to stay close to last year’s 147m. tons, assuming the use of maize for this purpose in the US declines slightly. With the reduction in the global grain crop estimate largely balanced by an upward adjustment in the opening stocks figure and a slight cut in the use forecast, the projection of world carryover stocks is unchanged from last month, at 360m. tons. However, the total for the eight major exporters is trimmed by 3m. tons, largely because of a reduced stocks projection in the EU. World trade in grains in 2011-12 (July-June) is expected to climb by 11m. tons to a record 254m., 4m. more than forecast previously, reflecting larger than anticipated wheat purchases after this season’s marked upturn in medium and lower grade supplies, especially from the Black Sea region, whose total grain shipments are set to total 55m. tons, up from only 22m. last year. Wheat – The second largest world wheat crop ever and ample carry-in stocks from last year, have sharply boosted global availabilities in 2011-12. While use is rising at a faster than normal pace, world stocks at the end of the season are still expected to climb to their highest level in a decade. Compared with last month, the estimate of world production is 1m. tons lower, at 683m., including a slight downward revision in the US, where the spring wheat crop was even smaller than expected. Stronger than previously projected feed use adds another 2m. tons to the global consumption forecast, at 679m., boosting the annual percentage increase to about three times the longer-term trend. Because of the increased demand figure, the forecast of global carryover stocks is 2m. tons lower than last month, at 200m., but these would still be the largest since 2001-02. The world trade forecast is lifted by 3m. tons from before to nearly 135m., only slightly below the 2008-09 record. Rather than reflecting a supply shortfall in any one country or region (as it did in 2008-09, when Iran’s imports were higher than usual), import demand appears strong in a wide range of countries, aided by competitive pricing in the major exporters, especially for lower and medium grades. Maize (corn) – While the US crop was slightly smaller than last year’s, larger outturns elsewhere are expected to lift world maize production to a new record of 853m. tons (826m.). With harvests in North America and Europe entering their final stages, attention is switching to the southern hemisphere, where farmers in Argentina, Brazil and South Africa are set to plant more maize than in 2010-11. Due to strong competition from feed-grade wheat and projected sluggish growth in industrial demand, world use is forecast to increase at a slower than average pace. However, with the total still expected to exceed output, 2011-12 ending stocks are forecast to fall to a five-year low. Trade in the year to June 2012 is forecast to increase by 1% due to strong demand from buyers in parts of Latin America, Asia and North Africa. Rice – Flooding in parts of Asia has negatively affected crop prospects in some key exporters. Nevertheless, bigger outturns in China and India are expected to lift global production by 2% in 2011-12, to a record 459m. tons. Total rice use is also forecast to expand by 2%, with a further small increase projected in the global carryover, to 100m. tons (98m.). Within the total, inventories in the five major exporters are forecast to increase by 8%, to an all-time peak of 32m. tons. World trade in calendar 2012 is forecast to contract by 0.8m.tons, to 32.5m., on reduced imports by Far East Asia, especially by Bangladesh and Indonesia. 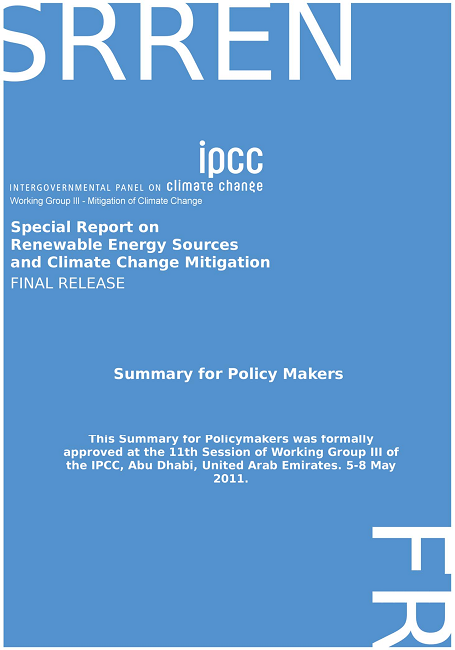 The Special Report on Renewable Energy Sources and Climate Change Mitigation (SRREN), agreed and released by the Intergovernmental Panel on Climate Change (IPCC) on 09 May 2011, has assessed existing literature on the future potential of renewable energy for the mitigation of climate change. It covers the six most important renewable energy technologies, as well as their integration into present and future energy systems. It also takes into consideration the environmental and social consequences associated with these technologies, the cost and strategies to overcome technical as well as non-technical obstacles to their application and diffusion. Hydropower represented 2.3%, whereas other RE sources accounted for 0.4%. In 2008, RE contributed approximately 19% of global electricity supply (16% hydropower, 3% other RE) and biofuels contributed 2% of global road transport fuel supply. Traditional biomass (17%), modern biomass (8%), solar thermal and geothermal energy (2%) together fuelled 27% of the total global demand for heat. The contribution of RE to primary energy supply varies substantially by country and region. The levelized cost of energy for many RE technologies is currently higher than existing energy prices, though in various settings RE is already economically competitive. 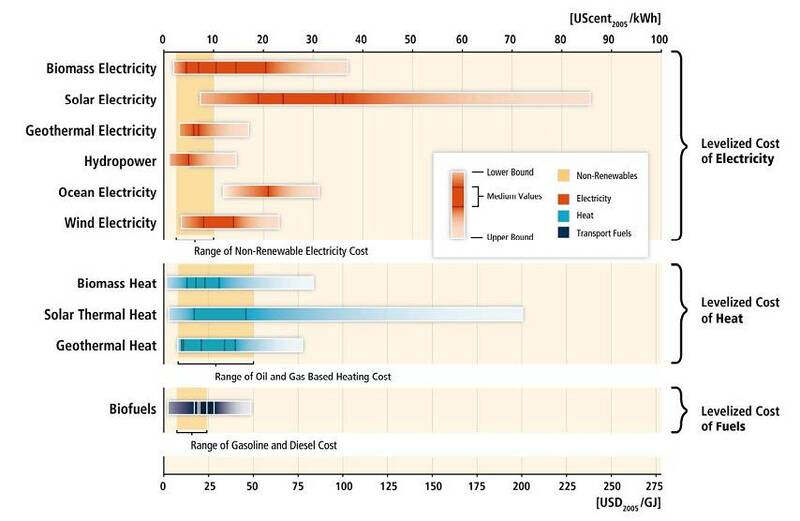 Ranges of recent levelized costs of energy for selected commercially available RE technologies are wide, depending on a number of factors including, but not limited to, technology characteristics, regional variations in cost and performance, and differing discount rates. Some RE technologies are broadly competitive with existing market energy prices. Many of the other RE technologies can provide competitive energy services in certain circumstances, for example, in regions with favourable resource conditions or that lack the infrastructure for other low-cost energy supplies. In most regions of the world, policy measures are still required to ensure rapid deployment of many RE sources. Monetising the external costs of energy supply would improve the relative competitiveness of RE. The same applies if market prices increase due to other reasons. The levelized cost of energy for a technology is not the sole determinant of its value or economic competitiveness. The attractiveness of a specific energy supply option depends also on broader economic as well as environmental and social aspects, and the contribution that the technology provides to meeting specific energy services (e.g., peak electricity demands) or imposes in the form of ancillary costs on the energy system (e.g., the costs of integration). The International Grains Council has released its monthly grain market report, covering the movements in and events of February 2011. Here are the main observations and forecasts. Outlook for 2011-12: Although forecasts of production and consumption are tentative at this time, global wheat supply and demand is projected to be broadly in balance in 2011-12. Strong prices will boost plantings in a number of countries in 2011, the global area forecast to increase by 3%, to 224m. ha., the largest since 1998. Although there are concerns about crop prospects in some major producers, world production in 2011 is forecast to increase by 24m. tons, to 672m., second only to the 2008 record. With 2010-11 southern hemisphere maize harvests only just underway and planting intentions for the next crop still uncertain, forecasts for 2011-12 are largely nominal. Given initial planted area assumptions and, assuming trend yields, larger maize harvests are forecast in several key producers, including the US and China. World production is expected to set a new record but, unless yields are exceptionally high, a second consecutive drop in world supplies is projected. Based on underlying strong demand, maize availabilities are projected to remain tight, with closing stocks set to fall for a third successive year. Commentary: Grain and oilseed prices continued their upward march in early February, with some values nearing the peaks seen in 2008. However, in renewed day-to-day volatility, markets then fell back sharply, partly on concerns about the impact of political turmoil in parts of North Africa and Near East Asia. There was little fundamental change in this year’s overall global supply and demand situation, although there were still uncertainties about the final outcome of ongoing maize and soyabean harvests in the southern hemisphere, as well as prospects for 2011-12 crops. In wheat markets, tightening milling grade availabilities and heavy international buying, including of feed wheat, spurred further substantial price gains early in the month, while worries about winter wheat crops in the US and China also featured. Several countries announced they would reduce or remove import duties. In the second half of February, nearly all earlier gains were reversed as the political unrest in some countries triggered a wave of selling in commodity futures. While maize (corn) prices also fell back somewhat, they still registered significant net gains. These reflected more fundamental future supply concerns, with evidence of continued heavy industrial and feed demand and speculation about the additional plantings required in the US to prevent a further decline in stocks. In contrast, oilseed prices registered a sharp fall despite initial strength, with markets also noting the improved crop prospects in South America. Trends in international rice prices were mixed in the past month, export values in Thailand firming somewhat while those in Vietnam falling back as the main harvest gathered pace. 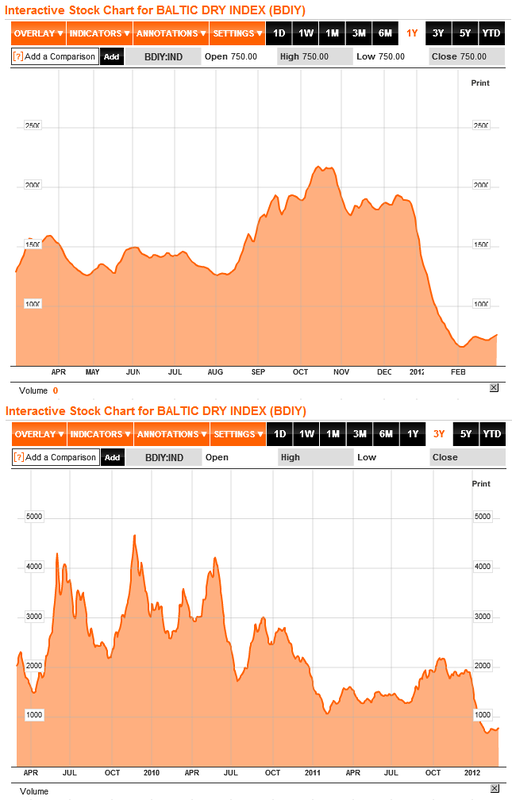 Dry bulk ocean freight markets, especially in the non-grain sector, initially declined further due to excess capacity, but then displayed a firmer trend, with higher bunker fuel prices also a factor. Grains supply and demand in 2010-11: The latest assessment of the global grain situation in 2010-11 shows little overall change from last month. Mainly due to revisions to the southern hemisphere crop estimates there is a 2m. ton increase in the world grain production estimate for 2010-11, to 1,728m. tons (1,793m.). However, this is accompanied by an increase of 3m. tons in the consumption forecast, mostly because of higher than anticipated use of maize for ethanol (in the US) and of wheat for feed. Total consumption of grains is now placed at 1,790m. tons, up from 1,761m. in 2009-10, therefore exceeding output by 62m. tons. This is reflected in a drop in stocks at the end of 2010-11 which, at 341m. tons, will be the smallest since 2007-08. Wheat: World wheat production in 2010-11 is placed only marginally higher than before, at 648m. tons, with an increase in the estimate for Argentina balanced by a reduction for Australia. The forecast of consumption is almost unchanged, at 661m. tons (649m. ), as a larger feed use estimate is offset by smaller figures for food and industrial use. Feeding of wheat is being boosted by competitive prices relative to maize and by ample lower-grade export availabilities in Australia and Canada. Strong export demand for these supplies contributes to an increased forecast of world trade, up by 0.9m. tons, to 123.6m. The forecast of world wheat stocks at the end of 2010-11 is unchanged from last month, at 185m. tons, down by 13m. from the start of the season. Maize: World maize production in 2010 is forecast at 811m. tons, 2m. higher than last month but down 2m. from the previous year’s record. Yield prospects improved in Brazil but declined in Argentina and South Africa. The consumption forecast is raised by 3m. tons, to a record 845m., some 30m. higher than last year. Industrial use is up 2m. tons from before, reflecting increased demand from US ethanol and HFCS manufacturers. World closing stocks are forecast to fall by 22%, to a four-year low of 119m. tons. US carryovers are placed at just 17.1m. tons (43.4m. ), lowering the stocks-to-use ratio to 5%. Global trade (July-June) is forecast to increase by 8% to 93m. tons. Rice: At 450m. tons, the forecast of global rice production in 2010-11 is placed slightly lower than in January, but is still 10m. higher than in the previous year, following bigger crops in India and China. Increased use in those countries is expected to result in a 2% rise in consumption, to an all-time high of 447m. tons, while the larger global outturn will also enable an increase in ending stocks, to 96.9m. (93.9m.). At 30.5m. tons, global rice trade in calendar 2011 is forecast to expand by around 1%. The World Bank’s Food Price Watch is produced by the Bank’s Poverty Reduction And Equity Group, Poverty Reduction And Economic Management Network. The World Bank’s food price index rose by 15% between October 2010 and January 2011, is 29% above its level a year earlier, and only 3% below its June 2008 peak. A breakdown of the index shows that the grain price index remains 16% below its peak mainly due to relatively stable rice prices, which are significantly lower than in 2008. The increase over the last quarter is driven largely by increases in the price of sugar (20%), fats and oils (22%), wheat (20%), and maize (12%). Maize prices have increased sharply and are affected by complex linkages with other markets. In January 2011, maize prices were about 73% higher than June 2010. These increases are due to a series of downward revisions of crop forecasts, low stocks (U.S. stocks-to-use ratio for 2010-11 is projected to be 5%, the lowest since 1995), the positive relationship between maize and wheat prices, and the use of corn for biofuels. Ethanol production demand for corn increases as oil prices go up, with sugar-based ethanol less competitive at current sugar prices. Recent United States Department of Agriculture (USDA) estimates show the share of ethanol for fuel rising from 31% of U.S. corn output in 2008-9 to a projected 40% in 2010-11. Increased demand for high fructose corn syrup from countries such as Mexico, as they substitute away from higher priced sugar, also contributes to higher demand for corn. Prospects of easing in this market depend partly on the size of the crops in Latin America, particularly Argentina, which has been affected by unusually dry weather due to the La Nina effect, and the extent of import demand from China in 2011 as well as oil and sugar price trajectories. Domestic rice prices have risen sharply in some countries and remained steady in others. The domestic price of rice was significantly higher in Vietnam (46%) and Burundi (41%) between June–December 2010. Indonesia (19%), Bangladesh (19%), and Pakistan (19%) have increased in line with global prices. These Asian countries are large rice consumers, especially among the poor. Rice prices have increased in Vietnam despite good domestic harvests. This is primarily due to the depreciation of the currency, which has fuelled overall inflation and expectations of higher demand from large importers and led to the minimum rice export price being raised by the Vietnamese government. Rice price increases in Sri Lanka (12%) and China (9%) have been relatively moderate in the second half of 2010, while in Cambodia and the Philippines the retail price of rice remained largely unchanged during this period. 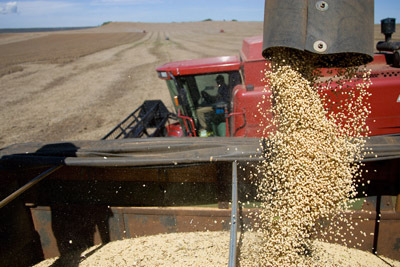 The International Grains Council (IGC) has released its Grain Market Report for 2011 January. The IGC said that world grains supplies are forecast to tighten in 2010-11 but the outlook is little changed from two months ago. World production is expected to decline by 3.8%, to 1,726m. tons: the wheat estimate is lifted on better than expected southern hemisphere crops but the maize total is cut. 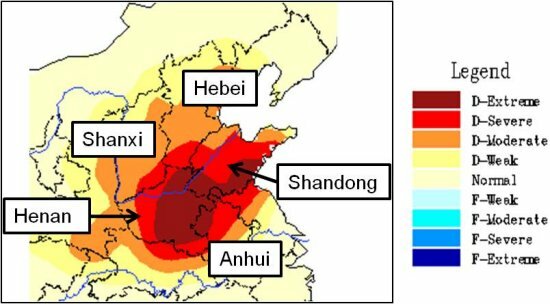 A serious drought has developed in eastern China over the past few months. Total precipitation has been scarce since October 2010, with some locations on the North China Plain receiving less than 10 percent of normal precipitation through December 2011. A lack of snow cover has deprived the dormant winter wheat crop of valuable moisture and protection from frigid temperatures and winds. Seasonably dry and cold weather is expected to continue for the next two weeks. USDA's WASDE said the impact of the drought has been mitigated by the widespread availability of water for irrigation, but crop stress could become serious if the drought continues after the winter wheat emerges from dormancy in February/March 2011. By far the biggest fall in grains output was in drought-affected Russia, with big reductions too in the EU, the US, Kazakhstan and Ukraine. A further rise in world grains consumption is forecast in 2010-11, to 1,787m. tons. However, at 1.4%, the rise is flatter than in recent years. The expansion in industrial use has slowed markedly, especially in the US ethanol sector, although recent use there has been higher than anticipated. Total feed use will only rise moderately this year. The forecast fall of 62m. tons in global carryover stocks mirrors the reduction in the major grain exporters, with big declines in Canada, the EU, Russia and the US. World trade in grains is expected to rise by 2m. tons, to 242m., only marginally more than before, with bigger imports by the EU and Russia expected to outweigh reductions in Near East and Far East Asia. Because of the fall of 29m. tons in Black Sea shipments, exports by Argentina, Australia, the EU and the US are expected to climb steeply. IGC said that international grain and oilseed prices advanced strongly in December and again in January, with some values at their highest for two years. However, export prices remained below the peaks recorded early in 2008. While there has been little fundamental change in the overall supply and demand balance in the past two months, markets were driven higher by concerns about supplies of quality milling wheat and the tightening outlook for maize and soyabeans. The influence of other commodities, including crude oil, also featured regularly on the major exchanges. For wheat, reports that the extremely wet conditions in eastern Australia would render at least one-third of the country’s large wheat crop unfit for flour milling were especially bullish. More recently, better prospects for US exports and a winter wheat acreage report showing a smaller than expected rise in Hard Red Winter wheat plantings further triggered buying. IGC said that China was among several recent customers for Australian feed grade wheat. For maize, there were worries about a reduced official US carryover forecast as well as about whether plantings for the next crop would be sufficient to prevent stocks falling further in 2011-12. The impact of dryness, attributed to the La Niña event, on Argentina’s upcoming harvest added to the market’s nervousness. Similarly, despite quite ample current stocks, US soyabean prices moved higher, initially because of continued heavy demand from China but more recently due to a lower official US supply estimate and strength in crude oil. Rice export prices also increased, but while Thai values in late-December climbed to a ten-month peak, they subsequently fell back as the main crop harvest advanced. After mostly declining since June, ocean freight rates for grains firmed slightly in recent months, despite a further slide in the Capesize sector. The US Department of Agriculture’s World Agricultural Supply and Demand Estimates (WASDE) for 2011 January has said that global 2010-11 wheat supplies are raised slightly this month as increased beginning stocks are mostly offset by lower foreign production. Beginning stocks for Argentina are up 0.9 million tons with upward revisions to 2008-09 and 2009-10 production estimates. Argentina production is also raised 0.5 million tons for 2010-11 as harvest results indicate higher-than-expected yields. Production in Brazil is raised 0.4 million tons as favorably dry harvest weather boosted yields for the 2010-11 crop. EU-27 production is raised 0.3 million tons based on the latest official estimates for Poland. More than offsetting these increases are reductions for Kazakhstan and Australia. Kazakhstan production is lowered 1.3 million tons based on the latest government reports. Australia production is lowered 0.5 million tons as heavy late-December rains and flooding further increased crop losses in Queensland. According to WASDE 2011 January, world wheat imports and exports for 2010-11 are both raised slightly. South Korea imports are raised 0.4 million tons, mostly offsetting an expected reduction in corn imports. Imports are also raised 0.2 million tons each for Thailand and Vietnam based on the pace of shipments to date and the increased availability of feed quality wheat in Australia. Imports are lowered 0.5 million tons for EU-27 based on the slow pace of import licenses to date. Major shifts among exporters are projected as importers focus on U.S. supplies to meet their milling needs. Australia exports are reduced 1.5 million tons as quality problems limit export opportunities. Kazakhstan exports are reduced 1.0 million tons with lower supplies. While Argentina marketing-year (December-November) exports are raised 0.5 million tons, exports during the remainder of the July-June world trade year are expected to be lower based on the slow pace of government export licensing. Global 2010-11 wheat consumption is projected 1.2 million tons lower, mostly reflecting reduced wheat feeding in EU-27, the United States, and Kazakhstan. Food use is also lowered for EU-27 and Pakistan. Partly offsetting are increases in feed use in South Korea, Thailand, and Vietnam, and higher expected residual loss in Australia with the rain-damaged crop. Global ending stocks are raised 1.3 million tons with increases for EU-27, Argentina, and Australia, more than offsetting the U.S. reduction. WASDE 2011 January said that global 2010-11 rice production, consumption, trade and ending stocks are lowered slightly from a month ago. The decrease in global rice production is due primarily to a smaller crop in Egypt, which is down 0.5 million tons (-14%) to 3.1 million. Egypt’s area harvested in 2010-11 is reduced 19 percent from a month ago and is down 30 percent from the previous year. A reduction in the Egyptian government’s support of producer prices has discouraged farmers from planting rice. Additionally, the Egyptian government has imposed water restrictions thus reducing irrigation water availability. Furthermore, government restrictions have reduced exports. Global imports are increased slightly due primarily to increases for Indonesia and Turkey, but partially offset by a reduction for Egypt. Global exports are increased slightly due mostly to an increase for Thailand, partially offset by a decrease for Egypt. World ending stocks are projected at 94.4 million tons, down 0.4 million from last month and last year. False carbon accounting for biofuels that ignores emissions in landuse change is a major driver of global natural habitat destruction, incurring carbon debts that take decades and centuries to repay; at the same time, the emissions of nitrous oxide from fertilizer use has been greatly underestimated, says a damning new briefing from the Institute of Science in Society (I-SIS), Britain. A team of thirteen scientists led by Timothy Searchinger at Princeton University, New Jersey, in the United States, pointed to a “far-reaching” flaw in carbon emissions accounting for biofuels in the Kyoto Protocol and in climate legislation. It leaves out CO2 emission from tailpipes and smokestacks when bioenergy is used, and most seriously of all, it does not count emissions from land use change when biomass is grown and harvested, says the I-SIS briefing. 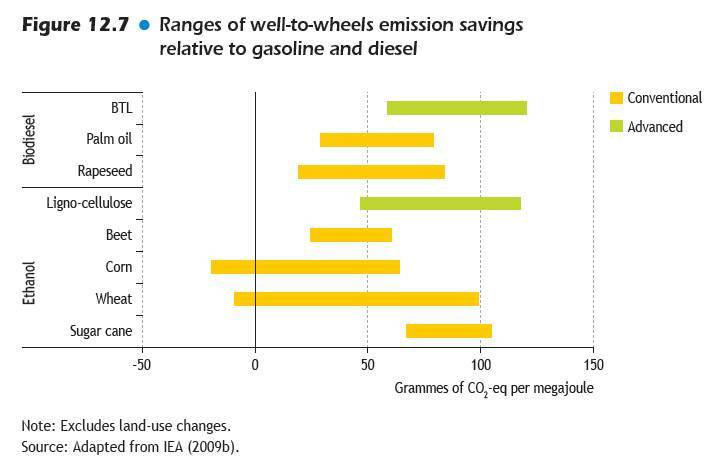 Graph from World Energy Outlook 2010 titled 'Ranges of well-to-wheels emission savings relative to gasoline and diesel'. 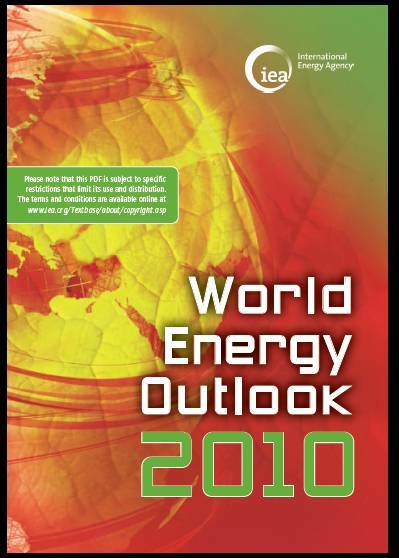 The short section is part of Chapter 12 – titled ‘Outlook for Renewable Energy’ – of the massive tome, and the section on Biofuels emissions is found in pages 372-374. 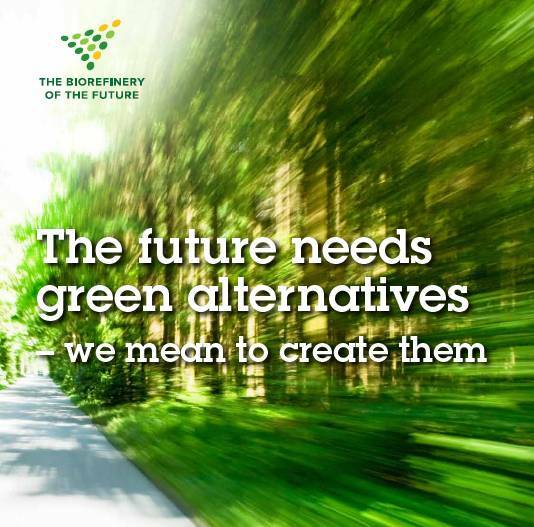 As the WEO must perforce sound upbeat about all forms and sources of energy, it ventures, “If appropriate feedstocks and process conditions are chosen, biofuels can offer significant net greenhouse-gas emissions savings over conventional fossil fuels”. That’s a big “if” there. “This is particularly the case with sugar cane ethanol, as much less energy is required to convert the biomass to ethanol.” In a laboratory perhaps, but as there are as many ways of converting sugarcane as there are types of cane, it would be difficult to say, wouldn’t it? “But variations are large and calculating average emissions savings is complex.” So they are, so it is. And there you have it, in black and white, from the venerable International Energy Agency itself.